The U.S. EPA has released the final Clean Power Plan rules, which contain some key changes from the original rule, as well as vague language related to using certain kinds of biomass fuel as a carbon reduction method. On July 30, Enviva Partners LP released its second quarter financial results, reporting revenue of $109.7 million, an increase of 60 percent over the corresponding quarter in 2014, on sales of 560,000 metric tons of pellets. On July 28, Drax Group plc released its half-year results for the six months ended June 30, delivering Europe's largest decarbonization project, on time and on budget, while also producing 8 percent of the U.K.'s electricity. The U.K. Department of Energy and Climate Change has announced several measures that aim to deal with a projected over-allocation of renewable energy subsidies, including changes to grandfathering provisions for biomass cofiring and conversions. An update of the proposed wood-to-energy (WTE) checkoff program was provided at the 2015 Pellet Fuels Institute conference in Williamsburg, Virginia. The concept is under review by industry, and a draft is expected late this year or early 2016. On July 22, the U.S. Senate Committee on Energy & Natural Resources introduced a bipartisan energy bill, titled the "Energy Policy Modernization Act of 2015." The committee was scheduled to hold business meetings on the bill on July 28 and July 30. Despite a sluggish quarter that saw a 3 percent decrease in net sales, a drop to $268 million compared to $277.3 million for Q2 2014 and a 19 percent decrease in earnings, Astec Industries Inc. continues to see activity in its pellet plant business. The Biomass Thermal Energy Council has announced plans to release a draft of the first thermal efficiency test method designed specifically for commercial-sized boilers that utilize solid biomass as a fuel stock. New Holland Agriculture is supplying equipment to the State University of New York that will aid in U.S. Department of Energy-funded research focused on finding ways to reduce the cost of delivering biomass for refinement. Viridis Energy Inc. recently announced that its subsidiary Okanagan Pellet Co. Inc., has commenced a major plant upgrade to address new regulatory requirements for safe storage and management of wood pellets. 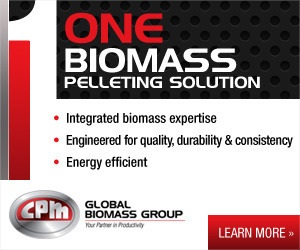 German Pellets has completed the commissioning of the first construction phase of its pellet plant in Urania, Louisiana. Work on the second construction phase, which will increase capacity from 578,000 to 1,156 million metric tons, is now underway. The Dewar's Aberfeldy Distillery in the heart of the Scottish Highlands installed a biomass boiler in late 2014. According to John Dewar & Sons, the system has cut the carbon footprint of the site by 90 percent.